Posted on June 5, 2015 by No Map Required Posted in Places, Tanzania	. Our safari was spectacular, in part, because we took time to meet local people and really soak up a bit of the local culture. 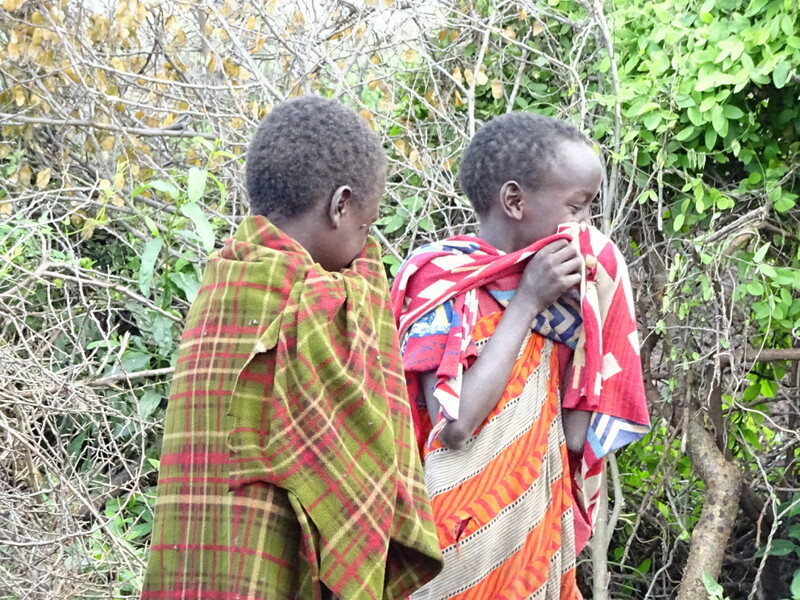 Not just a quick stop for pictures, either, but a couple of full days in Maasai Country. I think it’s interesting for both the Maasai people AND for us. Brian, our safari leader, described us as being like the circus…as in The Circus Comes To Town! I can see how we might look a bit of a spectacle and we always felt that we were giving the locals something to talk about for weeks. “Remember those white folks we saw last week? That one girl bought a bell right off one of our goats! They’re crazy!” They certainly gave US something to talk about! Needs more goat bell! 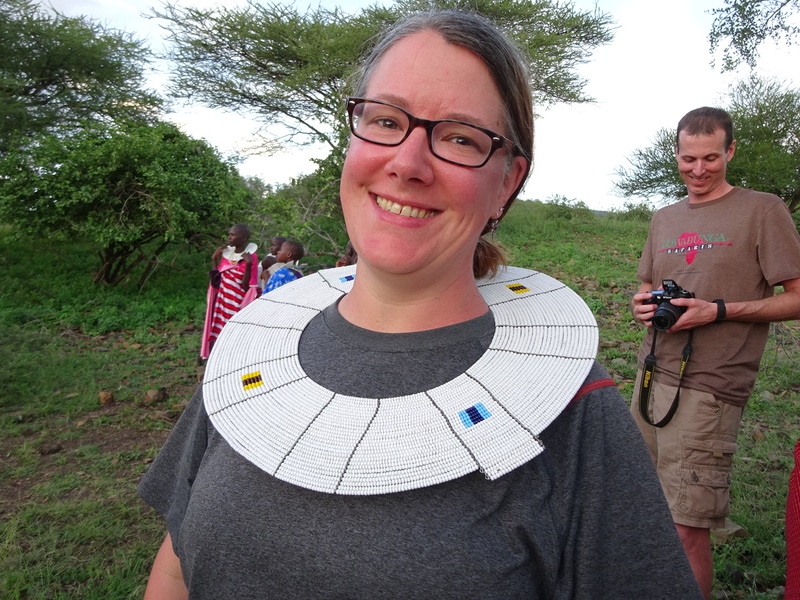 – best souvenir ever: a goat bell cut straight off the neck of a Maasai goat! Saw this scene over and over again: boys and their herds of goats, cows or donkeys. 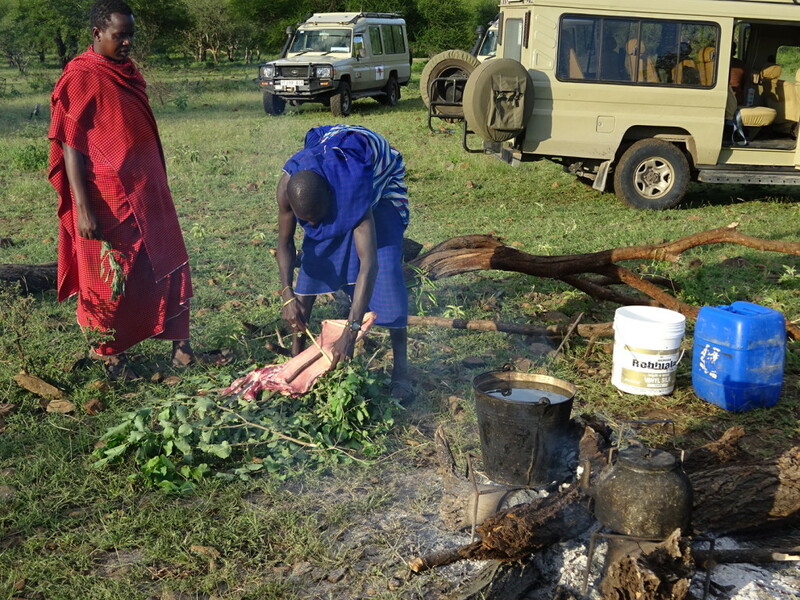 We camped in tents on lands both in and adjacent to Maasai land. Throughout our days there surprise events would pop up constantly as the Maasai offered to show us different things. Each day we’d get word that something was about to happen and we’d grab our camera and go! 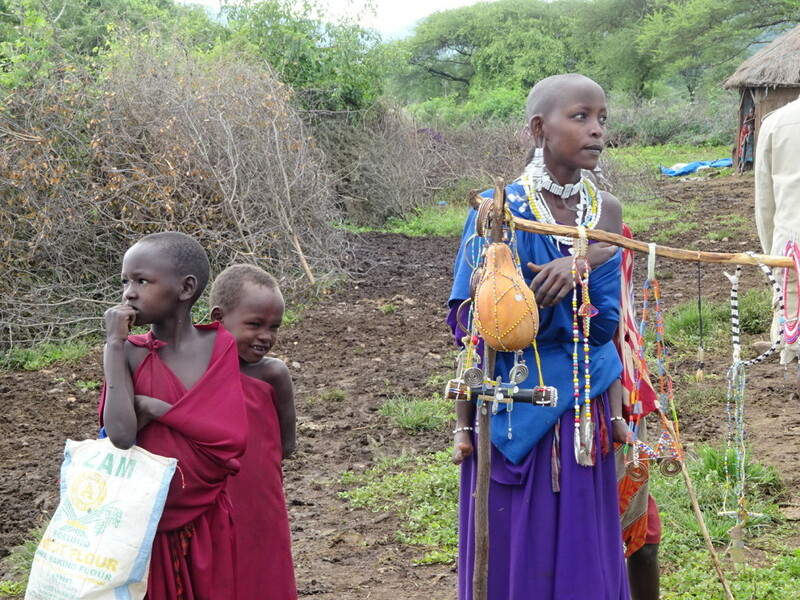 We started one day by visiting a Boma — a Maasai home compound. 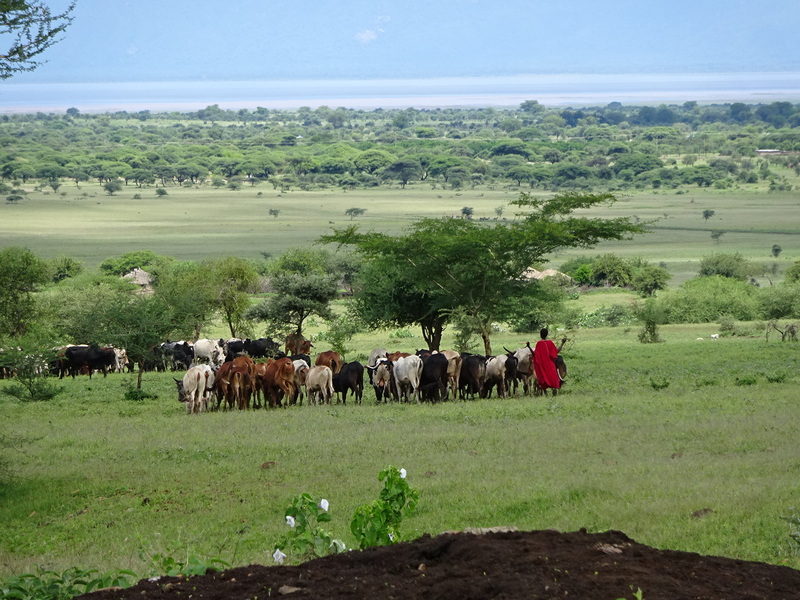 Yes, the Maasai are semi-nomadic, taking their cows to where the grass is best, but for periods of time they stay in one place and often return to the same compounds year-after-year. Maasai live with their cows. 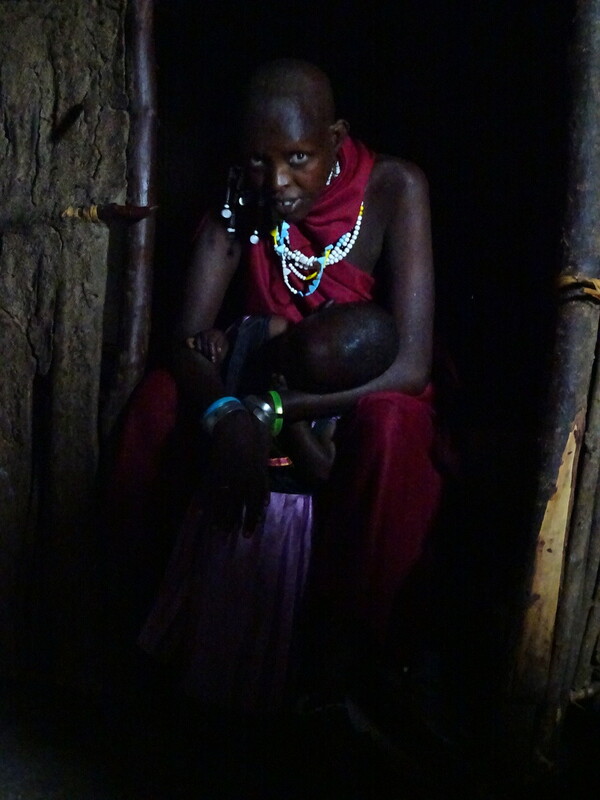 A mother and daughter inside their home. 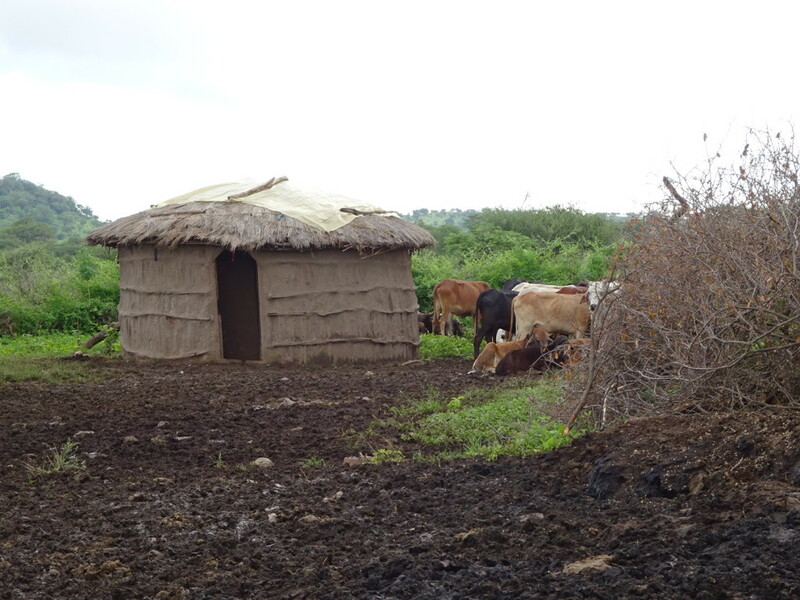 Women make the house huts out of grass, mud and sticks. They also raise the children, do all the cooking and gather all the wood and water, sometimes from long distances. Oh, and they make beaded jewelry in their ‘free’ time. Men dictate who does what, arrange marriages and watch after the animals. No doubt I’ve over-simplified a bit, but this is one society that I think is crushingly hard on women and girls. They are treated like property and often promised in marriage at a very young age. 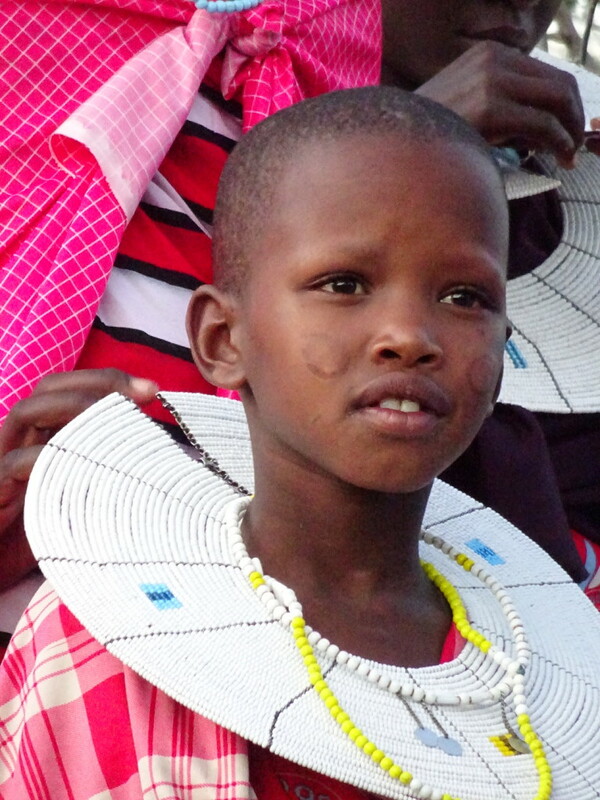 There’s generally no schooling for Maasai kids. An NGO built a school for the Maasai group near where we camped, but apparently didn’t ask the Maasai if they wanted one! It’s never been used, except to show us tourists. (Don’t get me started on NGO’s! That’s a another blog!) Our Maasai guide, Reuben, did say that they have started looking for a teacher, though Brian recalls him saying that a year or two ago. A teacher seems like a long-shot, but who knows? I certainly hope that some day Maasai girls can go to school instead of just getting married and gathering firewood. Ethnocentric? Absolutely, but it’s 100% what I actually think, so there you have it. Little children laughing at us tourists. In the afternoon Reuben took us on a nature walk where he described various plants and how they were used as traditional remedies and medicines. Pretty interesting, though we’d never remember any of them…and I really wonder how they discovered them in the first place! Who’d try boiling a root of a certain plant while chewing the leaves of a different one to help with diabetes? I mean really! 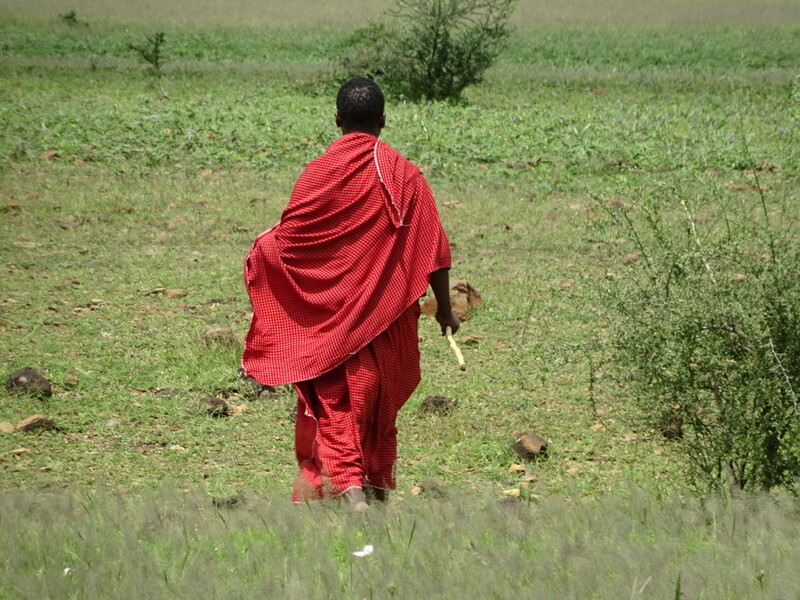 Reuben heads out – Follow that Maasai! 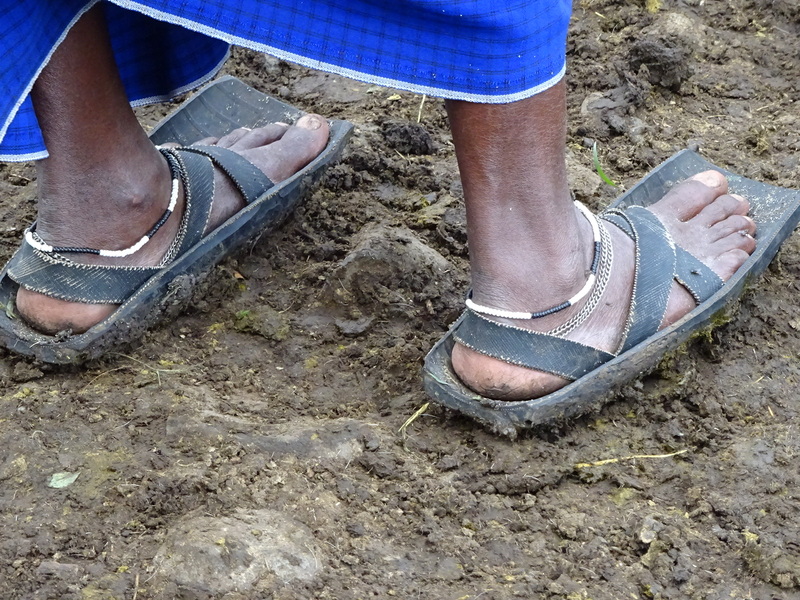 Typical Maasai footwear is made of recycled tires. Another version of the huaraches of Latin America! One afternoon there was a big ruckus. Cow and goat herds passed near our camp all the time, but this time they were closer… and getting a lot louder. Suddenly hundreds of goats and cows were filing their way through camp, just 15 feet away! For one particular goat, though, it was his final trip as our safari leader Brian had purchased him for that night’s dinner! The Maasai killed and butchered him for us. A few of us watched, though admittedly one of us watched from a long distance. I realized it had been over 30 years since I saw my dinner butchered. Gotta say, it’s quick! I passed on drinking blood and eating raw kidney, but braver folks than I (Aunt Casey) participated. What suprised me most is how little meat is on a goat! I mean, it looks like a biggish animal, but it turned out to have very little meat. 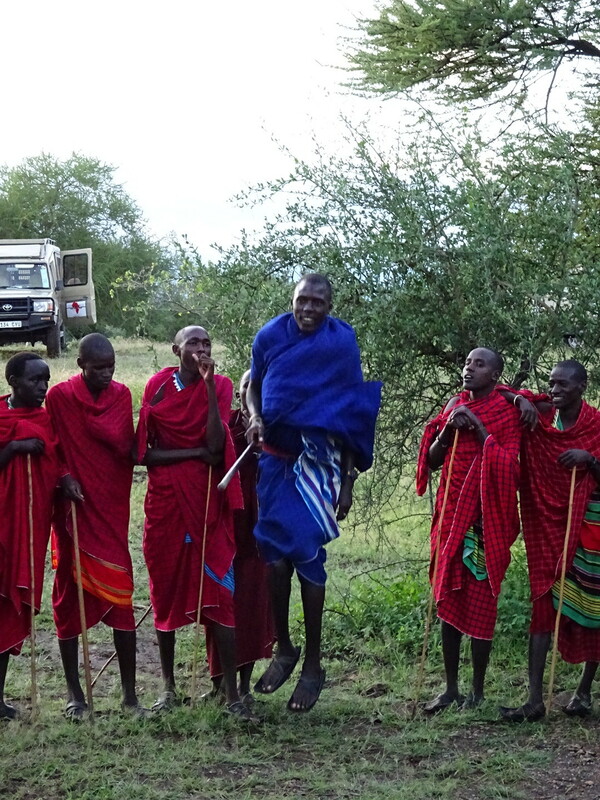 Finally the Maasai came back in the early evening for some singing and their infamous jumping! The men sang a tune and the young girls joined in harmony. Here’s a video of the singing. After a bit the men started jumping…some of them can get pretty high. As things progressed, the girls were then to walk up to the man they think is the best jumper (if I remember this all correctly). Somehow or another choosing a marriage partner is intertwined in this ritual (never mind that some of the girls are already spoken for). There’s also a bit of the men jumping and dancing towards certain women, sort of presenting themselves as potential partners. 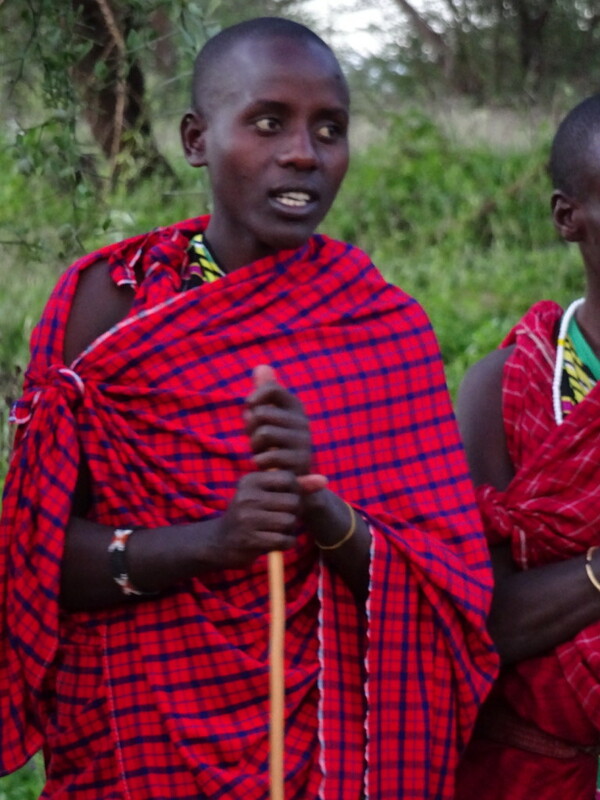 One of the blue dressed Maasai jumped at me a few times….I think he was attracted to my birthing hips! 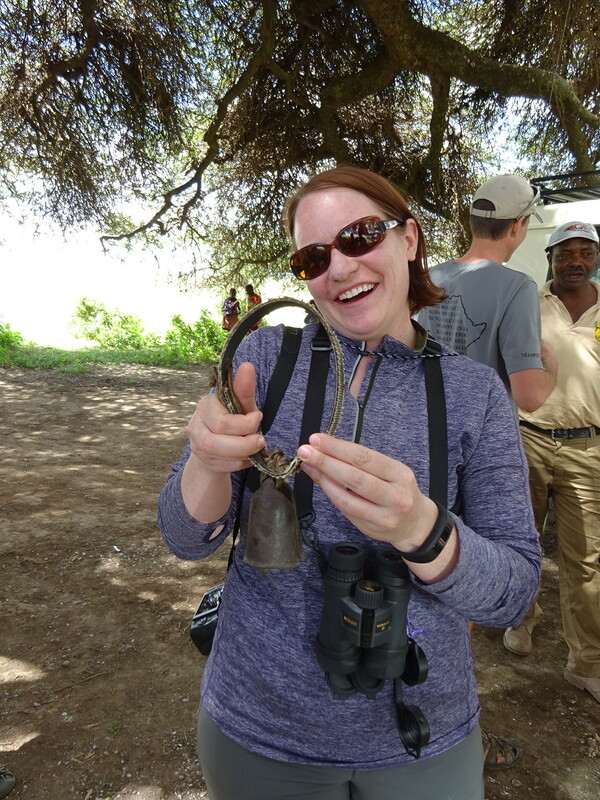 I was picked, along with most of the other women in the safari, to participate. It was fun! The girls would come over and present a necklace to one of us, then draw us into the crowd of women. The littlest kids definitely felt more comfortable if they could grab our hands and I think they liked feeling our skin as they kind of petted our hands. No surprise as our skin is so soft compared to theirs. That’s what happens when your ‘hard work’ is typing rather than wood gathering! Anyway, in the dance you’re supposed to walk towards the men while wiggling your shoulders to make the necklace move. It’s harder than it looks! 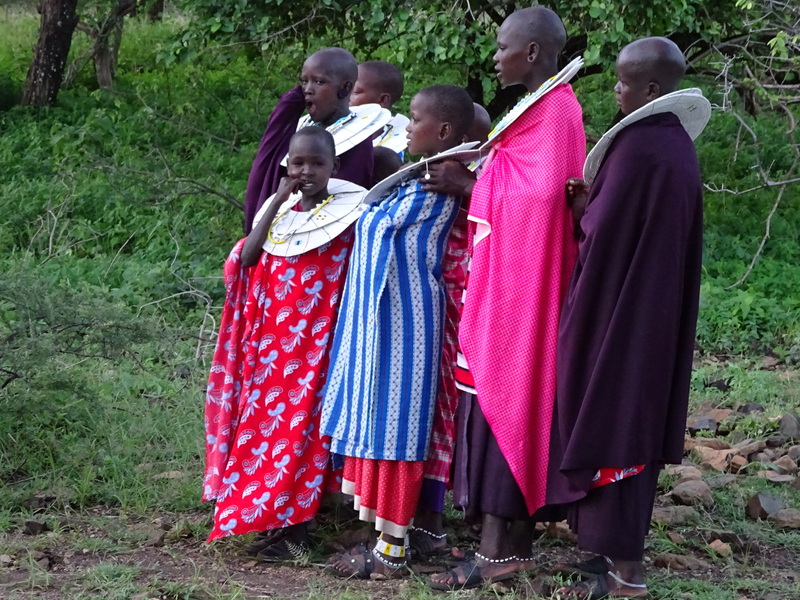 At the end, all the local and safari women and girls walked together; here’s a video. More than anything I loved all the singing. Girls singing and picking the best jumper. Incredible bead necklaces on the girls! Could he be the jumper you’re looking for??? Talk about a once-in-a-lifetime experience!! So? Have we convinced you to sign up for your own Cowabunga safari yet?? If not, more blogs are a-coming! Part 2: For the Birds! Part 3: The Great Migration! You captured this whole experience perfectly. It was an amazing step out of time. Even as a gay man, I’ve always admired your birthing hips and wish I could find some somewhere. Pingback: No Map Required | Safari Part 6: The Cowabunga Experience – Aunt Casey Tells It Like It Is!